We are still considering the period 1912-2000, and matters other than ‘Voynichese’. It was always over the fence; ‘someone else’s problem’. This is an interval post – just a pause for perspective. Erwin Panofsky and Theodore Petersen specialised in the Christian art of medieval and (northern) Renaissance Germany. Neither saw the manuscript as in that tradition. In 1932, after spending two hours examining the manuscript in New York, Panofsky had correctly dated its manufacture: ‘1410-1420-1430’, an evaluation whose precision would not be matched until 2011, when radiocarbon dating returned the range 1404-1438. Panofsky attributed its content not to Christian-German work but to “the southwest corner of Europe: Spain, Portugal, Catalonia or Provence; but most probably Spain” and to a Judeo-Arabic cultural environment. His reasons for saying otherwise in writing answers for Friedman’s ‘quiz’ questions in 1954 have already been discussed. For Panofsky’s dating see the letter of ‘E.L.V’ to Professor Thompson transcribed in ‘Correspondence’ at the end of my post ‘Expert Opinions – Richard Salomon‘. The original letter is in the Beinecke Library, Yale. …… and Panofsky was the first to cite any specific comparison but – as would thereafter become a constant in discussions of this manuscript – he compared just a single detail in it with a single detail from another manuscript, and did not even suggest the comparison close enough to call a ‘match’. As Nill later wrote, “except for one page partly taken from Alfonso’s manuscript, [the Vms] was entirely unlike any manuscript known to him.” The comparison was between one diagram from the Voynich calendar and one from Alfonso X‘s Libros del saber de astronomía. That Panofsky knew the latter is an indication of his range, for it exists in a single manuscript, and that in Madrid. Consider the range of exclusion implied. LATIN HANDS? – Salomon, Barrett and ‘not-saying-who’. Richard Salomon, a specialist in Latin palaeography, recognised only one line of marginalia, which he read as medieval legal German – and whose date he then applied to the manuscript as a whole. At that time, he had seen only a black and white photostat copy, and while an offer was made for him to see the original, I’ve found no record that he ever did. His circumstances after 1932 were so disrupted and so distressing that he was never able to return to his chief area of interest, lacking access to appropriate texts and references. Of the hand(s) within the main text, and of that which wrote the month-names, I’ve seen no evidence of his saying anything before or after 1932, though something may yet be found in others’ letters from him. Some Voynich researchers have guessed a Caroline hand; others as ‘influenced by the Humanist style’, but the specialists have said nothing, though not positively protesting Wilfrid’s opinion that the script was that of a thirteenth-century Anglo-Norman scholar. Remarkably little time or attention was paid to this matter of palaeography, and for my knowledge of these views I am indebted first to Nick Pelling, and through him to the sources he cited, including Reeds’ mailing list and articles by Barbara Barrett. Pelling disagreed with the latter, but for the sake of balance referred to Barrett’s views anyway. Other sites have, since then, copied (and sometimes rightly attributed) the same material. I’ve recently seen it asserted, with no evidence offered and my request for directions to the original argument refused with some vigour, that someone has argued a case for considering inscription of the German (and only the German) marginalia so closely contemporary with the rest of the work that we should believe the whole manuscript to be, in some sense, a product of German culture. Given the non-German month-inscriptions, the character of the imagery overall, the Italian binding of the book-block, the opinion of consummate experts with no ‘guess’ to grind… and so on, it is not an idea I’m willing to take on faith. Perhaps someone would like to raise the question on a forum? Do leave a comment if you find a clear answer. Dennis had said: ‘Hello, Adam!.. Mary D’Imperio, in her survey of VMs studies up to 1978, thought that alchemy might be the key to understanding the VMs. However, current [mailing-list] members, including myself, see little if any alchemical content in the VMs. None of us, however, are experts. What is your opinion on this. What alchemical imagery can you see in the VMs? All I can say is that I have never seen an alchemical manuscript with the same imagery and pictures as are found in the Voynich. …The main ‘alchemical’ resonance is supposed to be the ‘balneological’ section, but here I find no parallels with alchemical manuscripts, except in a very general way. If this was an alchemical work one would expect to find some other alchemical manuscript with similar drawings – but I do not know of one. … I have an open mind on the subject, but have yet to see any real parallels. 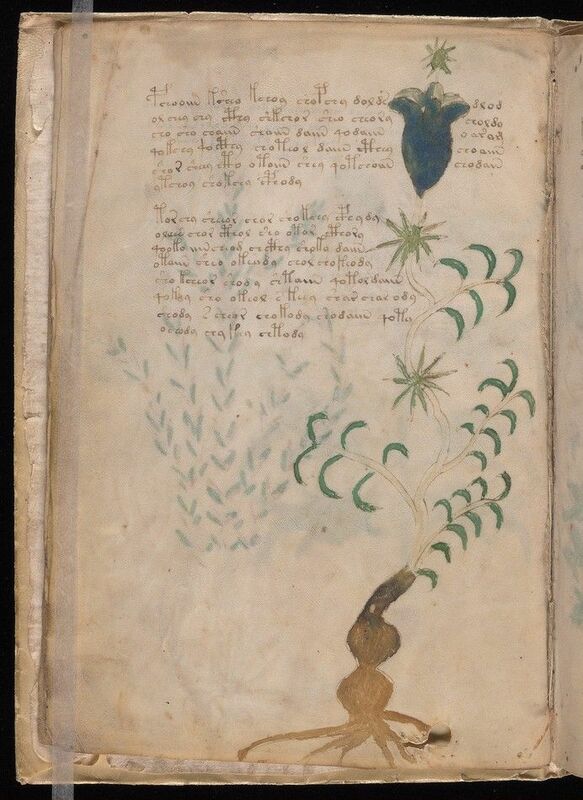 Perhaps one day I will find a manuscript that I recognize has common features with the Voynich – but not so far. I don’t think I could find any way at present to use alchemical manuscripts or ideas to throw light on the ‘Balneological section. .. but, once again, the expert’s view is ‘Not one of mine’. And rightly so. A specialist cannot blur the lines between what is demonstrably true, and what is desired true by others. Not that the others necessarily take heed. ‘alchemical’ notion revives, five years later… My apologies. The ‘alchemical’ text notion – killed off after McLean’s expert dismissal in the 1990s – was well and truly dead in early 2013. Unfortunately in presenting the analytical-critical study for folio 4v, I gave it a whimsical title, ‘Alchemy’s sweet scent’ as summary of my findings. In short, that the plant-group referred to by the drawing was that of the eastern clematis and that what had previously been imagined a curious form for the root was, in fact, a depiction of the double gourd, whose place in culture and iconography of the regions from east Africa to southern China (essentially the medieval trade routes) I summarised and illustrated, mentioning that clematis was not much used in eastern medicine (nor was western clematis in the Latin tradition), but the wood and root of eastern species were used to make scented substances (perfumes and incense etc. ), and when formed in metal the double-gourd was also used as a type of ‘small a‘ alchemical receiver, just as the ordinary sort was used for liquids. As usual, I accompanied the point-by-point analysis with comparative imagery, textual and cultural notes, and in this case additional comments on the trade in scents and scented materials into Cairo for the Mediterranean trade and, further, on the important role of mathematics in this sort of compounding. It had originated in India, and the Indian model was employed in Cairo too, so as illustration I included a table from the Brht Samhita. Updating the botanical nomenclature was tiresome, but that was done too, and I cross-referenced any plants mentioned that I had previously identified in the botanical folios. Being, from the first, under an informal ‘pay no attention’ ban by one of the most avid, and yet ill-equipped of the Voynicheros, who found it helpful to read, download and then disseminate my results verbally as anonymous ‘ideas’ yet to be explored, I did not expect my post to receive quite such widespread attention as it did. It received swarms of readers, throughout the period from 2013 until I closed voynichimagery in 2017. Imitators were numerous; some took this element from the post and some that, but among them a few were honest about their source, and others so inept that they brought a touch of humour. One chap especially – a wild fan of Edith Sherwood, Rene Zandbergen and Sergio Toresella – was helping in some project aimed at producing ‘The Official Voynich Herbal’. His job was to collect and collate others’ work, omitting such details and names as were considered unnecessary by the project’s unnamed director/s. Since very little new work was being done, just then, this chap got into the habit of taking nothing from my latest post but the name of the plant-group I’d given for the folio, reducing the name for a group to one name (to suit the western style of herbal), stripping out all the informing commentary, textual, iconographic, historical and cultural notes, archaeological studies (for proof of location and period), historical botany and information on use which provided evidence for the identification I’d offered. That done, he would leap up in the second mailing list about a day later and proclaim with many marks of exclamation that a ‘new identification’ had been made. But in this case, he was faced with the fact that the European clematis had no place in the Latin pharmacopoeia, does not have a bell-shaped flower, nor narrow leaves. And double gourds aren’t exactly standard motifs in medieval Latin art, let alone to be seen in any of the herbals. Rene Zandbergen (as I recall) kindly came to his rescue on the ‘gourd’ problem, showing an image of a vegetable garden in a copy of the Tacuinum sanitatis. Soon afterwards, the lad adopted the ‘foxy’ tactic of applying some new identification of mine to a different folio… more or less at random. The manuscript’s study is not only corrupted, but actively hindered by such practices, whose only benefit is to lend spurious credibility to persons or theories which have not deserved them. Lately, the most common tactic seems to be to use the mantra: ‘synchronicity’. Another chap became excited about the ‘perfume’ thing – though I did tell him that it wouldn’t do; the botanical section contains many more plants than were used in any sort of perfume, scented powder, or insect repellent ( a use I’d identified for another of the pictured plants, and which then synchronistically appeared in a post by Ellie Velinska, another close associate of the old guard but whom I’m inclined one of the several innocents who simply believed, when handed an ‘idea’ that it sprang fully formed from the donor’s imagination). It proved impossible to stem the ‘alchemical’ tide, to which that post seems to have acted as the bolt of electricity on Frankenstein’s monster, reviving the pile of dead matter abandoned since the 1990s. All I could do, and did, was to remind people of the more modest matter in my original post, which I re-published in a condensed and clearer form two years later, on 23rd August, 2015, under the title ‘Alchemy’s sweet scent made more readable’. The manuscript deserves more respect than it receives when used only to puff theories or personal ambition. The way my analysis of folio 4v was misused is just an example of the great many so used, whether my work or others’ – since the early 2000s, and largely why the study fails to advance. I suppose the lesson for us all is not to buy second-hand ‘ideas’; demand the donor provide his/her primary evidence and explain to you in detail his/her line of reasoning. If they can’t, it might be as well to tell them to go away and do their own work for a change. Dr. T. A. Sprague had travelled in the Americas as a botanist and as a taxonomist, spent time in northern India and served for forty-five years as a member of staff at Kew gardens, fifteen of them as Deputy Keeper of the Herbarium, and whose particular study of the Anicia Juliana codex required thorough knowledge of the Greek, Latin and Arabic herbals and their vocabularies. In 1947, shown some photostat copies of the plant-pictures, Sprague positively recoiled and railed at John Tiltman, “I have spent the last twenty years of my life trying to identify the plant drawings in the Juliana Anicia codex when the names of the plants are given in Greek, Latin and usually Arabic and you are asking me to identify these awful pictures.” It seems clear that none of them looked immediately familiar. More recently (2015) Alain Touwaide, whose field of study covers the Latin, Arabic and Greek history of medicine, drugs, herbals and medical manuscripts , wrote a seventeen-page essay published by the Villa Mondragone in a volume now, alas, out of print. There were no peer-reviews published in any Journal, so far as I can find, but the prominent enthusiast Rene Zandbergen sent a 1100-odd word summary-review to the late Stephen Bax’ site. The review began and ended with Zandbergen’s opinion that Touwaide added ‘nothing new’ to the manuscript’s study but had repeatedly returned to the possibility that the manuscript might be a fake. In which case of course it would be again (apparently) ‘someone else’s problem’. Alain Touwaide, ‘Il manoscritto piu misterioso – l’erbario Voynich’ in Marina Formica (ed. ), Villa Mondragone ‘Seconda Roma’, (2015) pp. 141-158. out of print. I’m sorry to add that certain comparisons widely offered as closely similar to pages from the Vms, and in some cases attributed to Touwaide, do not bear close analysis, but perhaps I’ll return to that matter at a later stage. Charles Singer, editor of an encyclopaedic History of Technology had a number of ‘ideas’ about the manuscript, reported by d’Imperio. None relate to the history of technology, or offer support for the ‘bathy-‘ section’s being describing a plumbing system. D’Imperio reported that “Singer sees tubes, pulpits and pipes as ‘organs of the body. '” I’ve seen no evidence that he ever attempted to argue the case or – more to out present point – that he offered a single text or illustration from the European corpus as comparison. Nor, apparently, did his wife Dorothea suggest to him any among the thousands she had inspected and catalogued in the British Library under the heading of Science and Pseudo-Science, as Lynn Thorndike reported in 1921. On Singer see also Rich Santacoloma’s interesting research-post, ‘The Voynich in 1905′, proto57.wordpress.com (19th. August, 2012). LATIN/ARABIC SCIENCE, PSEUDO-SCIENCE or MAGIC? 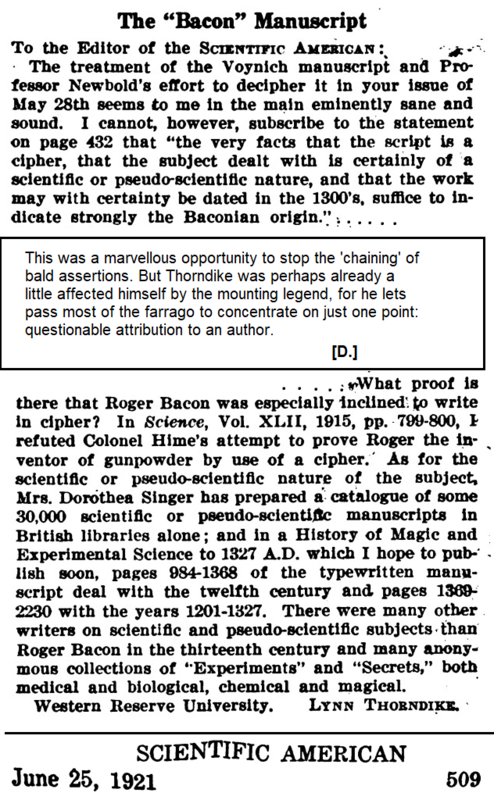 Lynn Thorndike who wrote a multi-volume history of medieval science and pseudo-sciences and had every reason, if he could, to set the Voynich manuscript squarely within a context that would refute Wilfrid’s ‘Roger Bacon’ guess, to which he felt great aversion, expressed more than once in print. But Thorndike offered no such argument, and never produced any other manuscript as close comparison for anything in the Voynich manuscript. ASTRONOMICAL/ASTROLOGICAL? – To my knowledge, the only specialist to offer a comparison with any astronomical/astrological manuscript between 1912 and 2000.was Panofsky (see above). Summary: “Not one of mine” is what the experts on western (and Arabic) manuscripts said of works from their own field, even while expressing, all the while, a feeling in some obscure way there’s something… Charles Singer, who claimed to see biology appears never to have suggested any comparable manuscript either. In any other field of study; if it were any other manuscript, there’s a logical inference that might be taken. Header Illustration: part of the East Room, Morgan Library, New York. Two years before the enforced exodus of the intellectual élite that followed the advent of Hitler, Panofsky became a regular guest professor in the United States, at the invitation of Professor Cook. He [Panofsky] lectured in the basement of the Metropolitan Museum of Art under the auspices of what was to become the Institute of Fine Arts, New York University’s graduate department of art history, and immediately made a deep impression on his American colleagues and students. William S. Heckscher, ‘Erwin Panofsky: A Curriculum Vitae’, Record of the Art Museum, Princeton University, Vol. 28, No. 1, Erwin Panofsky: In Memoriam (1969), pp. 4-21. (p.13). [Biography] Dr. Walter S. Cook, in whose honour annual lectures are presented at the NYU Institute of Fine Arts. The meeting with Mrs. Voynich is most easily explained by positing that both were consulting medieval and renaissance manuscripts in the Pierpont Morgan Library, for it was a worker there (the librarian?) Ms.Greene who offered to introduce Mrs. Voynich to the Professor. “Mrs. Voynich has been working at the Morgan Library, and Miss Greene continues to be most friendly and helpful. A short time ago she volunteered the opinion that she did not think any scholar in this country would be able to help us with the problem … [but now] a certain Dr. Erwin Panofsky … is at present in New York and Miss Greene suggested that she bring him and Mrs. Voynich together- very decent of her don’t you think.” – Letter from Anne Nill to H.Garland, (Feb 10th., 1932). Panofsky’s subsequent career in America; the value of his private (1932) assessment of the manuscript. Ingrid Rowland, ‘A Banker, a Scholar, and the Invention of Art History: The story of the Warburg brothers’, The New Republic Magazine (July 6th., 2014). Panofsky’s appointment to the Institute of Fine Arts in New York in 1933 and to the Institute for Advanced Study at Princeton in 1935, together with his extraordinary productivity and high profile as public lecturer in the following three decades guaranteed him a stellar career, and an influence within the discipline, and the humanities in general, that was then unrivalled for an art historian. …One of the serious shortcomings of Panofsky’s approach to images was his unwillingness to explore the social matrices in which [pictures] were produced and used. (review) Irving Lavin (ed. ), Meaning in the Visual Arts: Views from the Outside. A Centennial Commemoration of Erwin Panofsky (1892-1968) (1995) reviewed by Robert W.Gaston in International Journal of the Classical Tradition, Vol. 4, No. 4 (Spring, 1998), pp. 613-623. Panofsky wrote primarily on late medieval and Renaissance art in northern Europe and Italy, and mostly, but by no means exclusively, on painting. He was not omniscient, nor dispassionate. He revered humanism and like the majority of his own time, idealised the model of the auteur as creative spirit gifted with superior sensitivity, perception and so forth. It is the more appealing, humanist and individualist, counterpart for that obsession with the dominant white male which infused the whole of medieval Latin art and remained a preoccupation of historians in the European tradition for most of the twentieth century. Where Panofsky’s opinion differed from the majority. Absence of the ‘dominant white male’ theme – and numerous other defining themes of Latin (i.e. western Christian) art – from the imagery in MS Beinecke 408 is a powerful argument for the content’s non-Latin origin – something Panofsky recognised. He attributed it to southern (Sephardi?) Jewish origin saying he recognised influence from Islamic style and from Kabbalah. If he ever elaborated on these things in writing, no record of it has come to light. There are details in the manuscript which express the Mediterranean and/or Latin (i.e. western European) traditions – but in the present writer’s view these are plainly late-phase additions. They include (of course) post-manufacture items such as marginalia, but some details in the body of the work – principally the central motifs in the calendar’s diagrams. It never occurred to Wilfrid Voynich to suppose the work other than the individual creation (autograph) of an individual, ‘superior type’ and a white male European. Nor, apparently did others look much further than southern Europe and the figure of Ramon Llull. This phenomenon,by which the world is effectively defined as Europe – and into which nothing comes except by the authority and choice of a Latin European male – was usual among nineteenth century historians and particularly the Anglo-German school. It affected assumptions then, and is still with us, having deeply impacted on the course, nature and direction of the manuscript’s study for most of the period from 1912-2015. The present author found, still, in 2014, that the majority of Voynicheros imagine it impossible that anything of non-European origin could be found in Europe except that Latin European had fetched it or commissioned its being brought. This is what we call the ‘White Wall’ phenomenon, and that it should persist to the present day would surely distress Lynn White – a pioneer in the history of cross-cultural exchange upon whose pioneering studies so much more has now been built. ________________, ‘Tibet, India, and Malaya as Sources of Western Medieval Technology’, The American Historical Review, Vol. 65, No. 3 (Apr., 1960), pp. 515-526. Panofsky does not suggest the manuscript’s content came from any great distance, but the very fact that he could see the content does not evince the culture of Latin Europe sets his opinion of the manuscript apart from the majority. Panofsky differs again from the reflexive assumptions made by those writing about the manuscript from 1912-1954. He does not imagine any ‘author’ for the whole work in 1933 and even in 1945, speaks of a nameless figure, almost a generic one: the man writing down his life-time’s learning for his son. Even that idea seems to imply that much of what is written is to be seen as inherited from an earlier time. The majority simply presumed the work the creation of a Latin ‘author’ and the matter contemporaneous with the present manuscript’s inscription. On the other hand, Panofsky no more than anyone else during the twentieth century imagined that the work could be entirely derivative. In 1932 he saw it emerging from a community rather than an individual. BY 1954, in answer to Q.10, he speaks of “a doctor or quack trying to impart what he considered secret knowledge to a son or heir”. Social history did not exist as yet, except as a means to make lessons attractive for children or by way of that idealisation of medieval artisans reflected by the ‘arts and crafts movement‘. The first English-language History of Technology – its first volume – was published only in 1954, under Charles’ Singer’s editorship. The interaction between the history of events and the history of economic factors has always been in flux, and though England is given much credit for the study’s development, even in the 1950s it was often dismissed as ‘mere commerce’. Social history as a scholarly discipline only gained general recognition in the 1960s (initially termed ‘laundry-list history’) and women’s history gained its place still later. Comparative cultural studies were almost unheard of, and Lynn White struggled against the ‘white wall’ phenomenon for thirty years and more. In the context of his time, Panofsky’s approach to the manuscript and his forming opinions solely from the primary evidence – though by reference to his own wide range of substantial study – makes his the most important commentary we have on the subject of the imagery, even now. Because it suited the Friedmans believe that the text was a very clever, unique, cipher, they were obliged to adopt an ‘authorial’ idea of the manuscript, and this has proven a persistent habit in the study, though less emphasised since about 2011. I take as implied by the answer he gave to Friedman’s Q.10 that Panofsky saw the manuscript as deriving from earlier matter; something of the same implication might be taken from his alluding to Kabbalah in 1932. The ‘authorial’ idea carried an expectation of the homogenous autograph, an idea found in most commentaries on the manuscript to as late as 2010-2011, when the present author was obliged to ‘run the gauntlet’ in the second mailing list for saying the content could be no autograph, nor the work of a single author, because the stylistic variations indicated derivation from at least three earlier sources, each manifesting a distinct history and line of transmission to Europe. That opinion is now widely accepted – without reference to the present author’s evidence and argument – because after some months, one contributor to that mailing list recalled that the word ‘compilation’ is found somewhere in the ‘Voynich gospel’ – d’Imperio’s booklet of 1978. This official ‘sanction’ permitted the then-radical shift from the traditional ‘authorial’ to ‘non-authorial’ approach. ( My thanks to Don Hoffman for being the first to brave the picket-line and adopt the conclusions of my work, even use of the technical term ‘florilegium’ – which in medieval times meant a collection of textual, not botanical, items). Panofsky was among the very few to offer any explanation of the manuscript and of its content by reference to the primary document itself, and he never adopted Newbold’s impressionistic categories as others did – including the cryptanalysts’ who merely elaborated them. He avoided both the ‘authorial’ notion and Newbold’s idea of a specifically ‘biological’ section. Once again, neither Panofsky’s opinion, (nor the substantial evidence and argument provided by the present writer from 2009) saw the abandonment of Newbold’s and Friedman’s “categories” – with the result that one still sees Voynich narratives produced and adopted which unsupported by the historical evidence. On efforts to justify the ‘biological’ idea see e.g. Ellie Velinska, ‘The Voynich manuscript anatomy’ (September 11th., 2013). I am told, though have not the details, that a contributor to voynich.nu voynich.ninja is presently (Jan-Feb 2019) reprising Velinksa’s ideas and approach, though whether properly acknowledging the precedents, including Velinska’s work, you must discover for yourself. In either case, it is a nonsense within any theory insisting the manuscript entirely the product of Latin European culture. Da Vinci was a hundred years before his time, and he wasn’t born until 1519: at best eighty years after the manuscript was made, and at worst (for such ideas) almost a century. But the persistence of such notions relies, ultimately on an impression expressed by William Romaine Newbold. Opinions as conclusions from evidence. Unlike the majority of Voynich writers, before him or since, Panofsky derived his opinions from the primary source and solid historical and iconographic evidence. Every extant study by him displays a consistent rigor and his sense of obligation to the reader: he will explain how he reached each point in his conclusions by reference to direct, specific, and verifiable reference across a wide range of historical, textual and art-historical material – always with a focus on the primary evidence. One may differ, but one is never asked simply ‘to believe’. His aim is not persuasion but elucidation. It constitutes a forensic approach which was to that time, and is largely still, scarcely employed in discussions of Beinecke MS 408. One must suppose that had he been asked to do so, Panofsky could have produced a study of the manuscript – its form and imagery – which would have substantially altered our understanding of its content. But all he was asked to do was fill out Friedman’s questionnaire. A brief outline of Panofsky’s usual practice is offered here.